If you want to join the military, you will be asked to take a few different type of questions. The Armed Services Vocational Aptitude Battery (ASVAB) is the first you will see when you decide to visit the recruiter prior to enlisting. You may also take this one day in your high school as one of the few standardized tests you must take throughout your years in school. Knowing the basics of a gasoline powered engine will help. For instance, questions number 1 and 2 are the amount of detail that is typical in the multiple choice engine section. Striking Tools - Hammers, sledges, and mallets. Cutting Tools - Bolt cutters, Hacksaw, Tin Snips. Clamping Tools - Pliers, Vises, Clamps. Measuring Tools - Tape rules and calipers are used to measure material. Leveling Tools – A plane, a bulb level are used to check materials are level before securing. Taking sample questions for the Auto & Shop Information subtest of the ASVAB is valuable way to familiarize yourself with the test. This section of the test consists of twenty five (25) multiple-choice questions that must be answered in 11 minutes. The questions, as you will see below, are generally about car parts and operation as well as shop tools and processes. 5. If a car uses too much oil, which of the following parts may be worn? These questions are not easy especially if you have never used or tried to fix an engine. This may require you to "book learn" the parts of the engine, tools, and safety procedures in the machine shop. 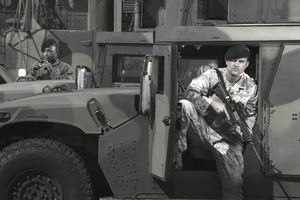 The ASVAB is multiple-aptitude battery that measures developed abilities and helps predict future academic and occupational success in the military. There are a total of 225 questions in the paper and pencil exam which has a total of eight other subtests, including general science, arithmetic reasoning, word knowledge, paragraph comprehension, mathematics knowledge, electronics information, mechanical comprehension and assembling objects. It takes between three to four hours to complete. There is now a computer version of the ASVAB called the CAT-ASVAB that has considerable fewer questions and takes one hour and 30 minutes. To learn more about that test, visit http://official-asvab.com/catasvab_app.htm. For more practice questions, you may wish to pick up a copy of my book, ASVAB for Dummies. Practice Taking the ASVAB with such programs as the Kaplan Course Book. There are also several websites that offer free questions for the ASVAB test. How Is Your VE Score Computed On The ASVAB Test?